Nigerian Housemaid In Oman Sexually Abused By Her Boss | PHOTOS! Big Brother Naija 2018 winner, Miracle Igbokwe, has reportedly been named an Education Ambassador for Imo State. Some days ago Rochas Okorocha’s son-in-law, Chief of Staff, and choice as next governor of Imo State, Ugwumba Uche Nwosu stated that he wants the state to honour Big Brother Naija’s Miracle and Nina. 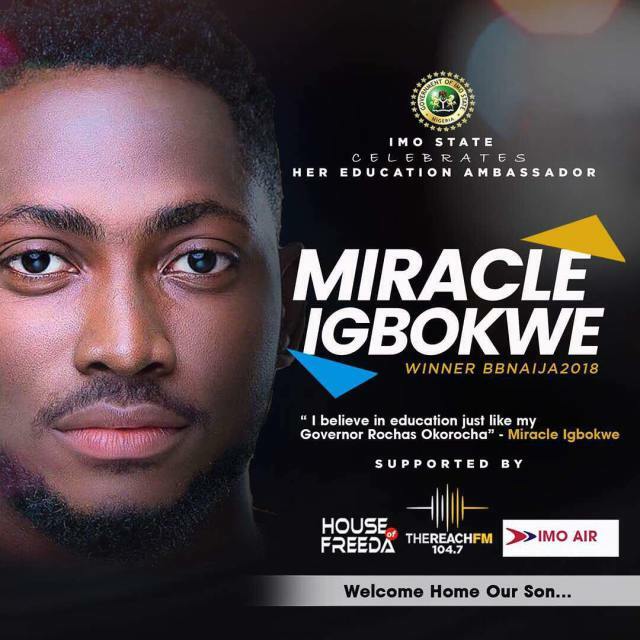 Recently, Miracle shared a flyer on his Instagram page with the Imo State government welcoming him home and calling him their Education Ambassador. She campaigned with her bike for Buhari, now she regrets…. “May God Give Nigerians The Patience To Tolerate My Government” – President Buhari.